Ramon Luhn Mieth, 4th child of Everett and Augusta (Luhn) Mieth, was born at Cairo, Nebraska November 29, 1928. 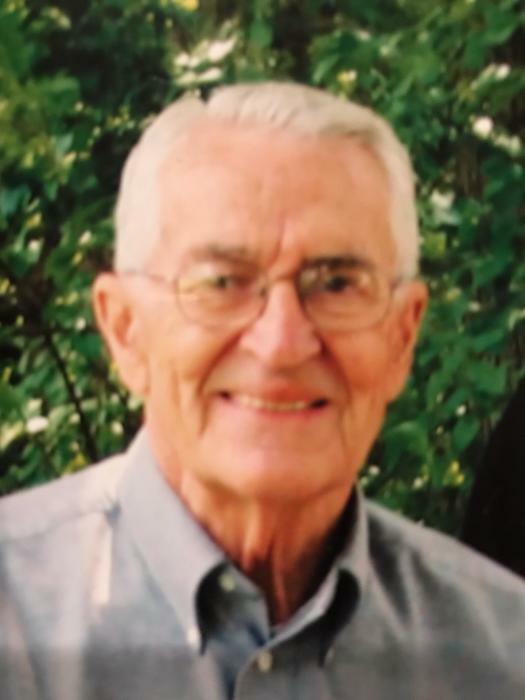 He passed from this life Thursday, March 28, 2019 at Hebron, Nebraska at the age of 90 years. Ramon attended Hall County rural schools and graduated from Cairo High School. His secondary education included a Bachelor of Arts degree from Hastings College, Master of School Administration from Colorado State College, and other graduate studies at Trinity University and San Antonio College, San Antonio, Texas. Ramon served in the United States Air Force from October 1950 until being honorably discharged in October of 1954. On July 20, 1953, Ramon married Kathleen Wehrman of Nelson, Nebraska. They lived in San Antonio, TX, Springview, NE, Nelson, NE, before settling in Hebron, NE. To this union four children were born: Mary, Linda, Douglas and Bruce. His career in education began in 1954 as a teacher, coach and later Principal at Keya Paha Country High School, Springview, Nebraska. As Superintendent of Public Schools, he was superintendent at Springview, Nelson, Hebron, and Ruskin, Nebraska school systems. The years ranged from 1957 to 1990. For ten years (1976-1986) Ramon was Executive Vice President, Director of Purchasing, and Corporate Secretary for Reinke Manufacturing, Deshler, Nebraska. An event that was to shape Ramon’s life forever took place on a bright sunny morning in February 1945 when he and a friend drove to Grand Island and he took his first flying lesson. Since that time, Ramon accumulated several thousand hours of flying time in both single-and multi-engine aircraft, having flown over 40 different models. He owned his own aircraft business – Great Plains Aviation. Both of his sons went on to become licensed pilots, as well. Ramon was a member of the Hebron Presbyterian Church, Aircraft Owners and Pilots Association, the American Legion, Nelson Lodge No. 77 AF & AM, 32 Scottish Rite Mason, and the Tehema Temple Shrine. He was along time supporter of Hastings College, the Osborne Legacy Project, and a faithful supporter of Mission Aviation Fellowship. He was also known as a builder of airports in Nebraska and many improvements to the Hebron Airport bore his signature. His most rewarding and memorable contribution to the Hebron Community came in 2006, when he partnered with Blue Valley Lutheran Homes in the establishment of The Gardens, a specialized care unit for patients with Alzheimer’s disease, the disease that took Kathy from him. Kathleen preceded him in death as well as his parents; brothers Stuart and Paul Mieth; and sisters Margaret Quaring and Clarice Wilcox. He will be forever remembered by his children: Mary and David Lontchar, Gig Harbor , WA, Linda and Alan Krenke, Hartland, WI, Douglas and Susan Mieth, Crystal Lake, IL, and Bruce and Carla Mieth, Lincoln, Ne; 10 grandchildren, Rachel McCreight, Gregory Lontchar, Adam Krenke, Alex Krenke, Amelia Boggess, Sarah Mieth, Kara Hinrichs, Dylan Mieth, Kayla Oman, and Bryanne Mieth; 5 great grandchildren, Brooke McCreight, Grey Krenke, Evelyn Hinrichs, Ada Hinrichs, and Everett Mieth; many other relatives and a community of friends. Funeral services will be held 10:30 AM Monday, April 1, 2019 at the First United Presbyterian Church, Hebron, Nebraska with Pastor Gail Cross officiating. Burial will be in the Hebron City Cemetery with Military Honors by Thayer County American Legion members. Price Funeral Home, Hebron, Nebraska was in charge of these arrangements.